LD Allen Branton and 4Wall PA Light the 32nd Annual Rock & Roll Hall of Fame Induction Ceremony | Press Center | 4Wall Entertainment, Inc.
Brooklyn, NY- Last month, the Rock and Roll Hall of Fame inducted its 32nd class: Joan Baez, Tupac Shakur, Electric Light Orchestra, Pearl Jam, Journey and Yes. 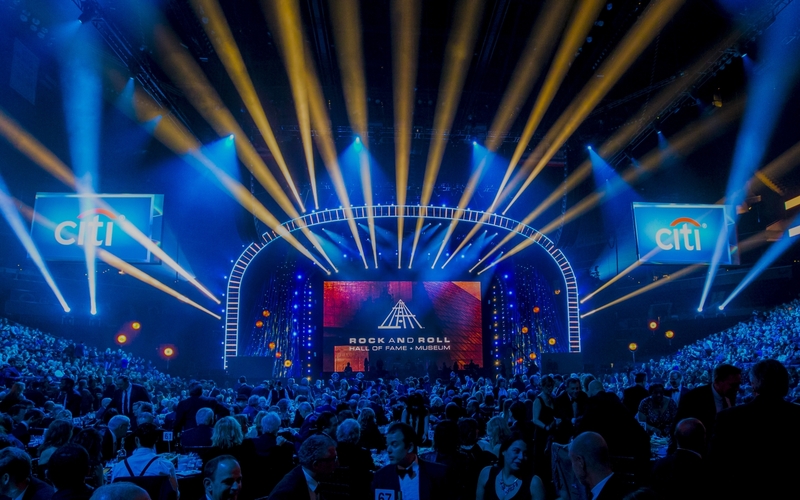 Legendary Lighting Designer Allen Branton lit the illustrious annual event held at the Barclays Center with gear provided by 4Wall PA.
Having designed for this particular client for nearly 20 years, Branton has garnered some leeway in terms to his design approach. "When the ceremony moved from its previous location at the Waldorf Ballroom, there was a shift away from what I would term a 'documentary style' towards a pure 'rock concert style'," explained Branton. Despite the shift in styles, the LD's goal each year is to create a lighting design that can service both the rock concert and induction ceremony aspects of the show, not to mention TV. "We also have to factor in the vast range of music we are lighting so flexibility is a real consideration," said the LD. With the ceremony being broadcasted to millions of people on HBO, Branton created the design for his rig from the stage out. "Television is mostly a close up medium, so the type of attention you might give to creating looks by ﬁxture positions in a tour really becomes secondary to the function the light is playing inside the little box that is a television set," explained Branton. "So, I build the design based on the positions that best complete the various tasks I need to accomplish." 4Wall provided the LD with Clay Paky Scenius Profiles for key lighting, TMB Solaris Flares for band effects, and Clay Paky Sharpys for a variety of looks. "The Sharpy played its classic role as an accent beam fixture," said Branton. "We also used it for something we like to call 'dappling', which is an interesting technique for background painting that we credit our Lighting Director Felix Peralta for creating." The LD was also impressed with the ROBE BMFL WashBeams 4Wall provided. "The horsepower to coverage ratio along with the shutter-cut feature is really unique and invaluable," explained Branton. "They allowed us to lower the ﬁxture count for the audience wash, saving us time, which was really critical for our schedule in this venue." Branton was not only impressed with the equipment 4Wall provided, but also the consistent quality of service he has received over the years." "There aren't enough good things that I can say about Brad, Brett and their team at 4Wall," said the LD. "I have been working with them for many years, and I point out they are the best in the business whenever I get the chance. The accountability they take in ensuring a good outcome, at every step of the process, is really unrivaled." Branton's LD team also played a key role in ensuring the event was a success. "I can't even get started without Felix Peralta, Kevin Lawson, and Darren Langer," Branton said. "It's been an absolute privilege for us all, sharing such a meaningful moment in these great performers' careers. We couldn't be more grateful." The 32nd Annual Rock & Roll Hall of Fame Induction Ceremony is now airing on HBO throughout 2017 and is available to stream on HBO Now or HBO GO. (25) Chroma-Q Color Force II 12"